Posing on the beach. 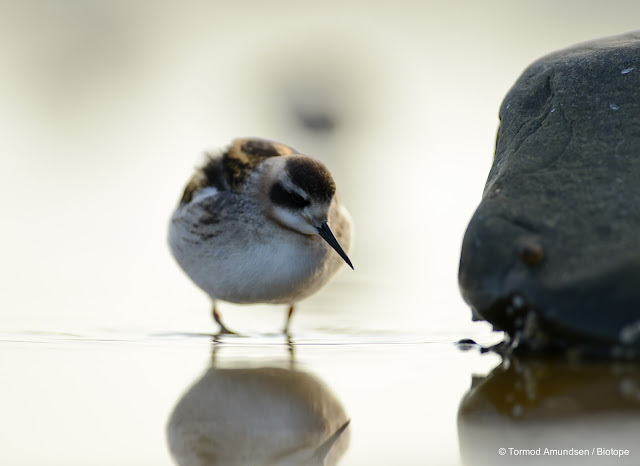 Young Red-necked Phalarope (svømmesnipe). View from the photo hide. The "Get-low-stealth-type" bird photo hide. Ready for action by the Sunddammen tidal pond in Vardø. 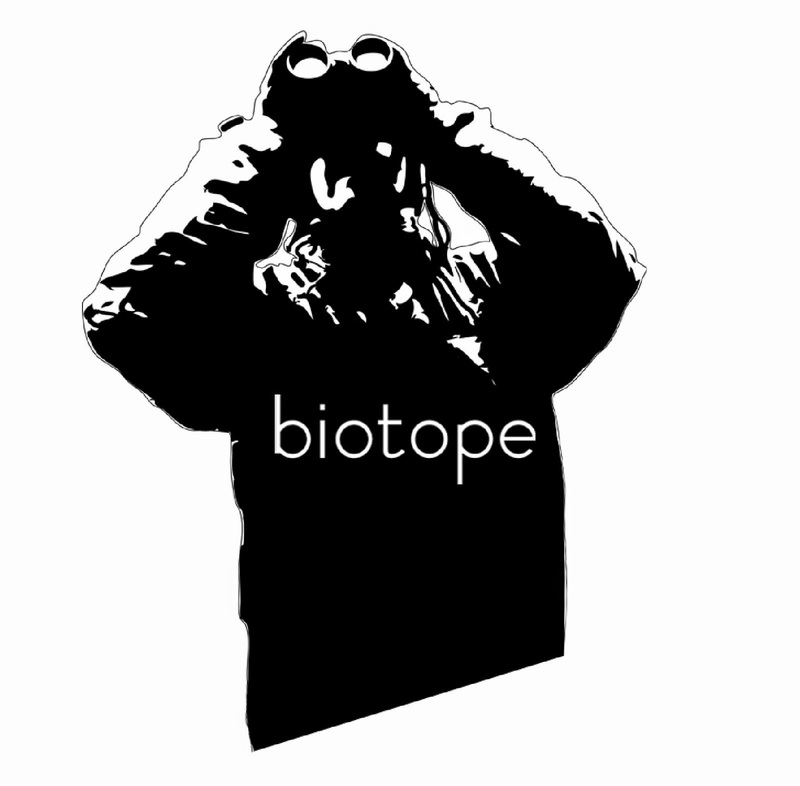 Many of the Biotope projects are about making architecture in which sharing a nature experience is a key part. Finding good shelter for a couple of hours of seawatching with good company is great (like the Steilnes hide)! We also design birding architecture where the sharing and even education is important. Like in the ´Outdoor Amphitheater / Bird Tower - concept´. This project is a very different one. This is a ´hard-core-one-man-experience-project´. There is very wide variety of birds. We look for a wide variety of ways to experience birds and nature. Getting close to nature without disturbing is a true privilege. Seeing birds within a hands reach, doing what they normally do as if you were not there is simply amazing. You may not look very cool walking around in a photo hide, and it is not the most comfortable of vessels. But it it works amazingly well. Once crawling on the knees with the hide on top, the birds almost do not mind your presence. When you are flat on your belly and slowly crawling towards the birds, completely covered by the hide, the birds do not mind at all. Within minutes birds are surrounding the hide. This hide was never designed to be a very comfortable experience, it is simply designed to remove movent visible for birds. The aim is to get low. At the level of the birds. Usually we think of the term ´birds perspective´ as aerial views. This is the very opposite point of view. 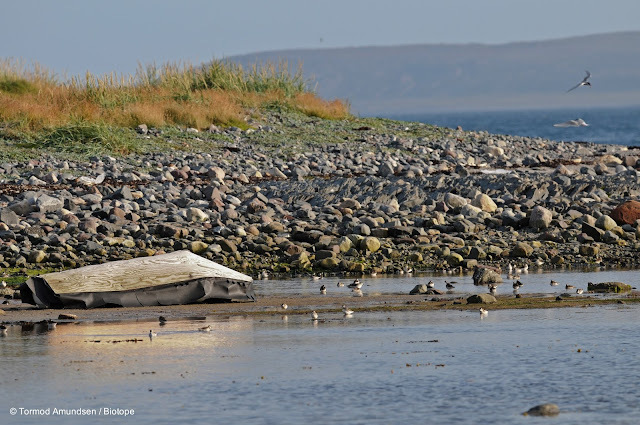 The hide makes no impact vertically, meaning the feeding waders in the area can walk up close to the hide and still have a very good overview. After all, birds are always on the alert, looking for birds of prey and other dangers. 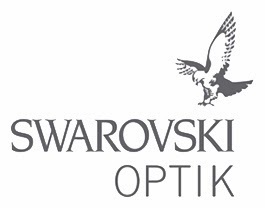 Designed for birds to feel more relaxed, and therefore improving the birding / photo experience. 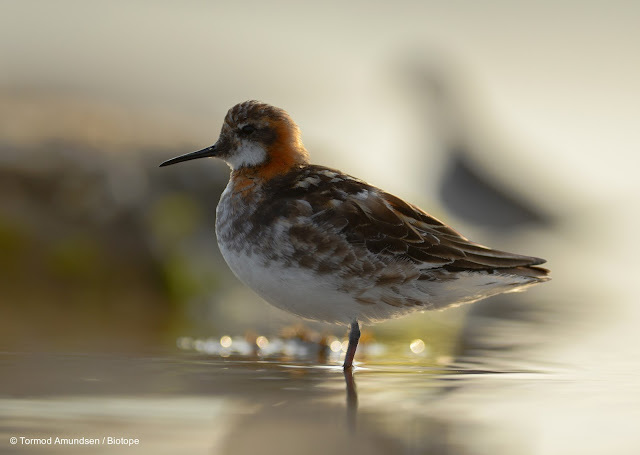 The Phalarope, and other wader photos where taken during an hour in early August. 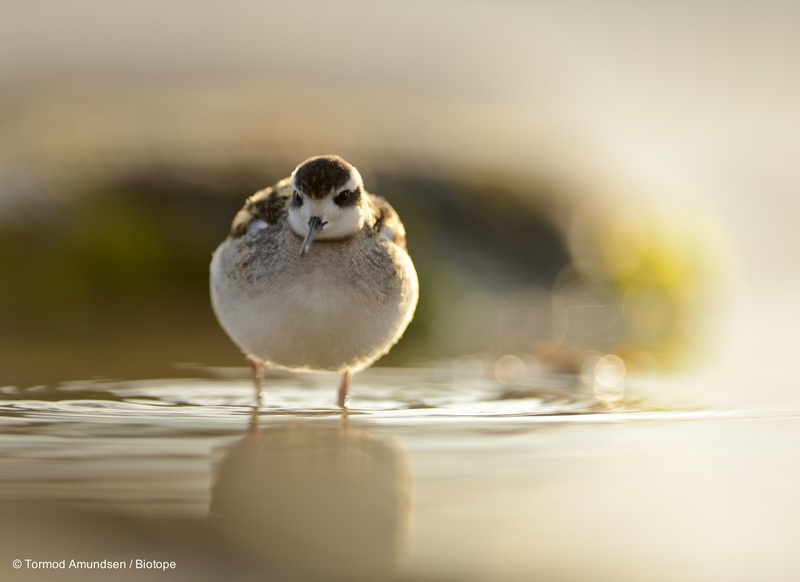 Young Red-necked Phalarope (svømmesnipe) searching for a snack. In late July and early August we had approx 250 Phalaropes in the Sunddammen tidal pond. Only 1 per 100 birds was an adult! Seems Phalaropes had a good 2013 breeding season. 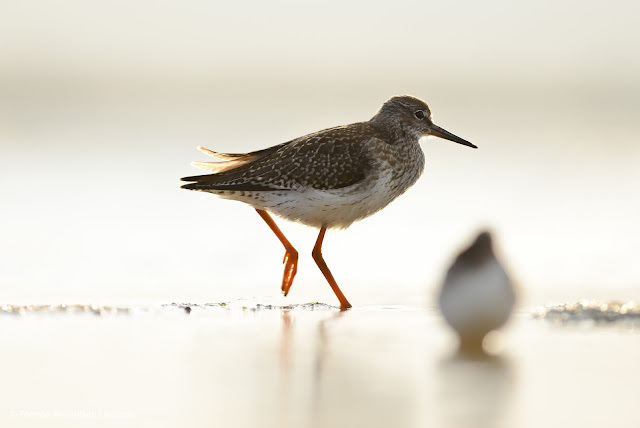 Young Redshank (1cy) / Rødstilk. The Redshank seemed like a giant bird compared to the Phalaropes. 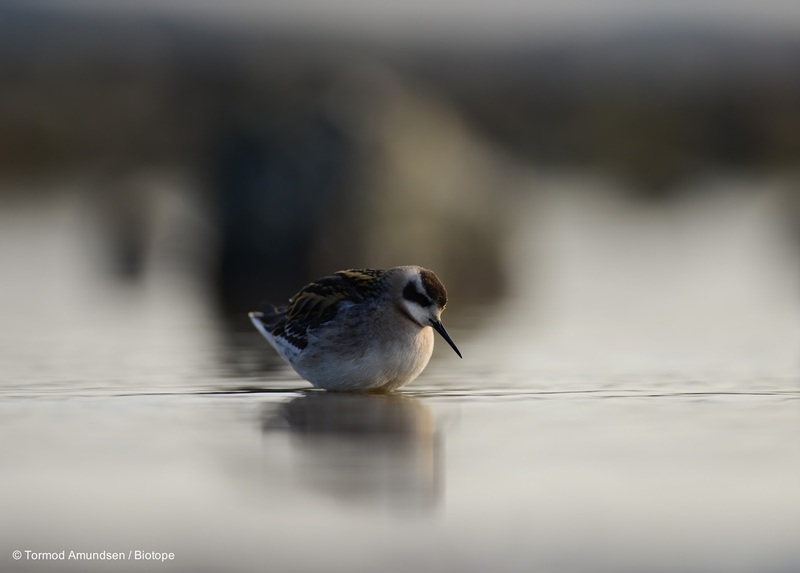 This is birding from a Phalaropes perspective. This photo hide is almost arhcitecture meeting clothing. Maybe we can call it wearable architecture. Check out this 5 minute making-of-video (link to youtube version). After making a couple of other protoype bird photo hides, the aim this time was to make a hide that was quickly made, low weight, low maintenance, low budget and fairly easy to manouver once inside it. Comfort and spaciousness had less to do with this project. The hide consists of few elements: one board of 4mm plywood, cut and folded to a self-supporting form. The buoys are the ´wheels´ of the hide, easily gliding over both sand and rocks without getting stuck. They are also very durable. Walking around in Vardøs fishing harbour gave me the idea of using buoys. Finally there is a fabric covering the gap between the ground and the plywood shell. Voila. The video, a very fast production, shows the making over two short afternoons at the Biotope office, and then the testing of the hide. Hope you enjoy it. Prototyping, testing and more prototyping.. The Strolling photo hide prototype: This one was made in August 2012. I guess it can be called the comfy version of the new Stealth hide. It is based around the same principles as the Stealth hide: photo flaps surrounding the base of the hide, and it is movable. However as with all prototyping, the idea is to test and find weaknesses and then improve them. The mobility of this hide was ok. It has wheels and it is easy to take for a stroll. However on a sandy beach and in kelp the wheels tended to get stuck, and to be honest, manouverability is not great. It is a bit weighty for a movable hide. But the upside is the convenience part. You can comfortably stay here for a day. Note that the concept of comfort is clearly very different for a birder / bird photographer to what most people would call comfort. In this hide I spoiled myself with a bottle of fine ale and a dried Reindeer heart for lunch. Pure luxury. And the birds performed too. I had amazing views of Temminck Stint, Dunlins, Common Ringed Plover, Golden Plovers, Sanderligs and quite a few more species. The biggest issue that needed to be solved was actually the wheels. Nice idea, less then optimal functionality. Meaning wheels simply rust, and being by the sea this hide strolled ok for a couple of months, and thats it. Not good enough for something that should be low maintanance and easy to use over time. But again, protoyping is all about learning. 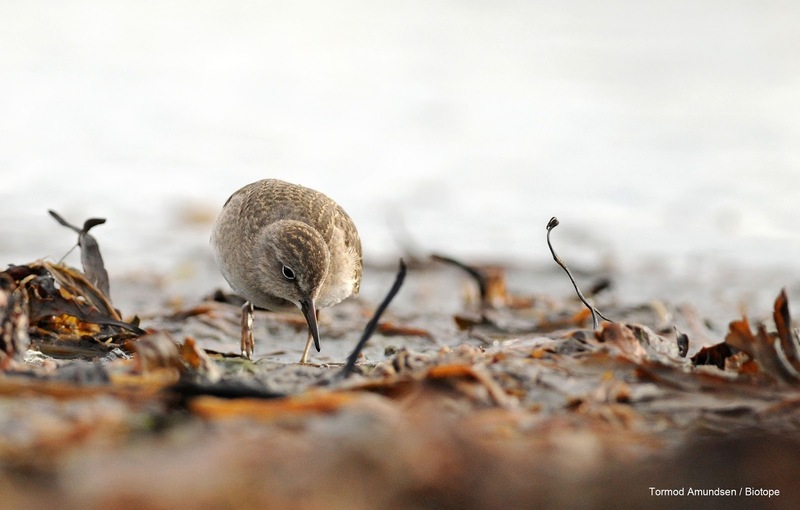 Temminck Stint feeding at Smelror beach, Vardø. From the Strolling hide, August 2012. Midsummer night in Varanger is full of life. I spent one night silently at the very edge of a pond. Hidden by a simple canvas, the Red-throated Divers was very obviously aware of my presence. They did not seem to be bothered by me, and kept swimming and diving as normal, although never closer to me then about 8-10 meters. I kept thinking of the Stealth bird photo hide, and wondered how that would have made a difference. Surely the hide would have looked a bit out of place, but removing movement is the key ingredient. 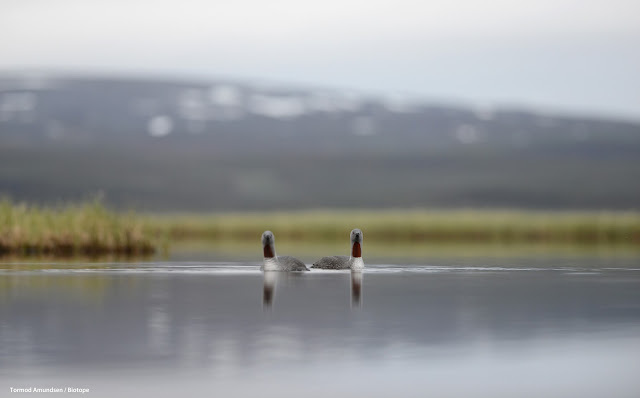 Maybe designing a Tundra-wetland-style photo hide will be a coming project..
Red-throated Divers, by night. Komagdalen in July 2013. Covered by a wool blanket cover only. The wool proved to be a perfect cover material as it held the snow and instantly made me blend with the landscape. However the Steller´s Eiders kept some distance, as movement was still visible. (Full story of this great Kiberg experience).This winter we will bring the new Stealth hide to Kiberg. We are working on an upgraded model for this experience too. To be continued..
A few more photos from the Stealth hide. 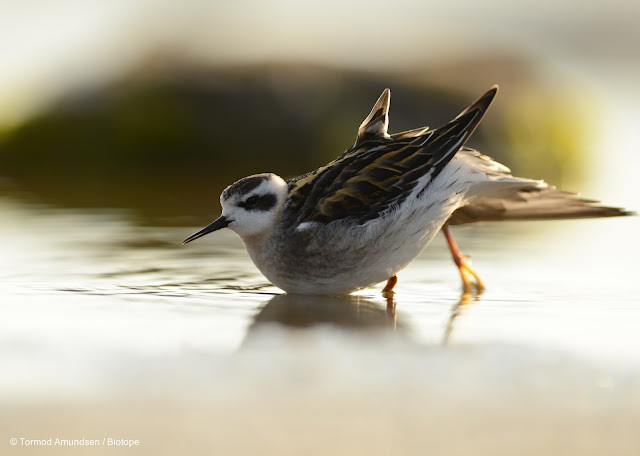 Sunddammen in Vardø is truly a bird hotspot. You just have to look closer, preferably with the help of a hide. 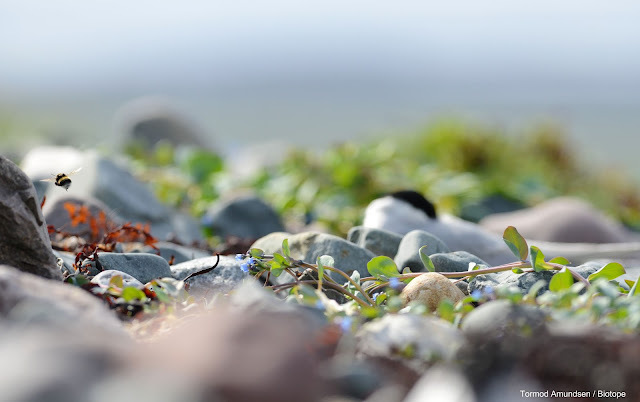 Arctic Tern relaxing and a Bumble Bee fly by, at Sunddammen, Vardø in july. Thanks for tuning in to our website. More stories of architecture and nature to come. 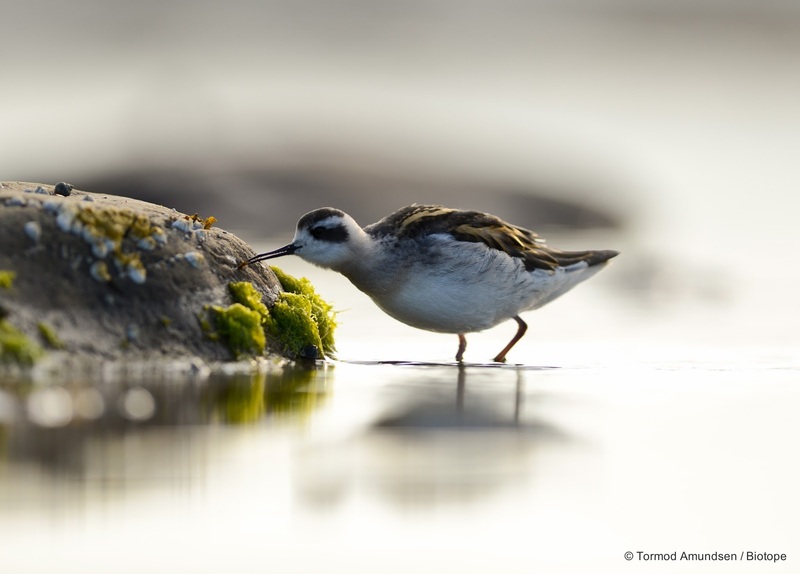 The next big thing for us is the Rutland Birdfair in England, where we are both exhibiting and giving a talk. 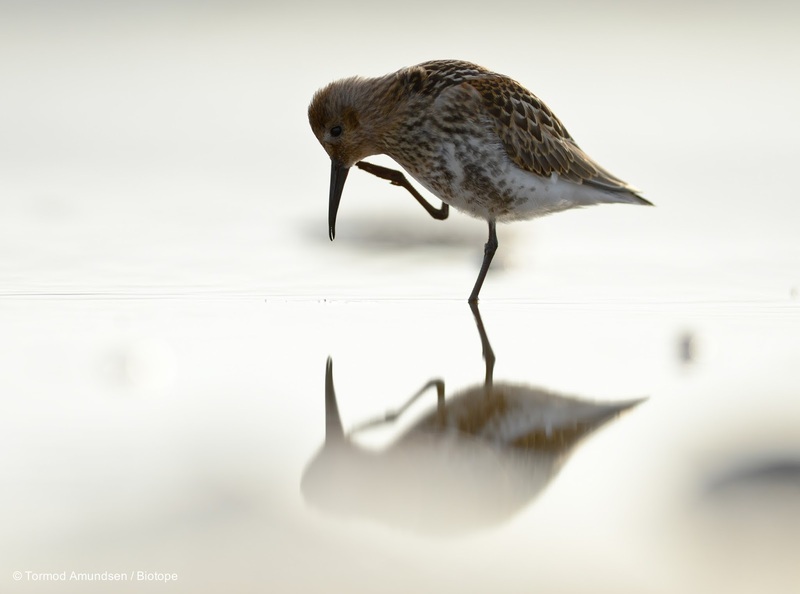 Hope to see you at Birdfair! Meanwhile feel free to check out our Facebook page for news, views and daily updates from the Biotope office. Or go straight to our Arctic Norway bird news twitter account for strictly bird info. Thank you, and to be continued..